Badugi offers something a little different if you’d like to try draw poker with a few twists. Draw poker is a variant of the game in which players can opt to discard cards and replace them in order to make a stronger hand. We think it helps to have a basic understanding of betting and bluffing before trying Badugi – and it also features different hand rankings – but you can read all about it below. The aim of Badugi is to have the strongest four card hand at the showdown or otherwise convince your opponents that you do. Low cards are stronger than high cards (as in Lowball) and the ace is low. Presuming there are players still left in the game following this betting round, players in turn can discard all, some or none of their cards to be replaced by others from the deck. Discarded cards are junked unless the deck runs out of cards. A second betting round now takes place as before, followed by another draw, then a third betting round and draw followed by a fourth betting round and draw. Assuming there is more than one player left in the round, the showdown can now take place. 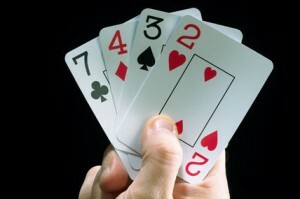 The best four card hand wins and four cards will always beat three cards which will always beat two cards and so. As low cards are strongest and high cards are compared first, this takes a bit of getting used to. For example A234 of different suits is the best possible hand while four Ks of different suits is the worst hand. Only one card counts if you have more than one of the same suit and with a pair, just one card counts. For more details, refer to our Badugi hand ranking chart here.